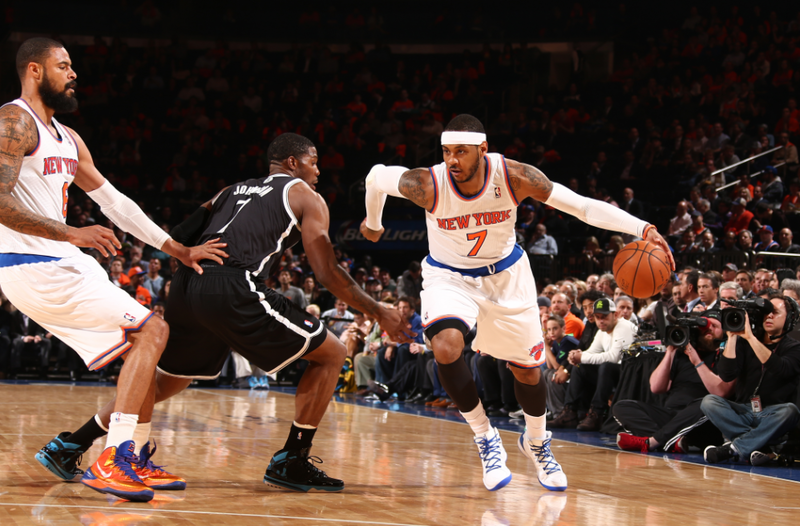 The Knicks (33-43) crushed the Nets (40-34) on Wednesday night at The Garden, beating their crosstown rivals 110-81. J.R. Smith was the game’s leading scorer with 24 points. Smith, who has been red-hot lately, also grabbed 8 rebounds and dished out 6 assists. Carmelo Anthony was right behind Smith with 23 points of his own to go with 10 rebounds, 3 assists, a pair of steals, and a highlight block. Tim Hardaway Junior also filled it up, finishing with 17 points and knocking down 3 shots from downtown. Iman Shumpert had one of his best games of the season, scoring 10 points, racking up 5 steals, locking down Brooklyn’s key players, and making several highlight plays. None of the Knicks-Nets games this season have been close. The Knicks won by 30, then lost by 23, then won by 29. But hey, any time we can see the Knicks win without having panic attacks in the 4th quarter, we’ll take it. The Knicks really needed this game, and they got it. With the Hawks losing to the Bulls, the Knicks and Hawks are now tied in the standings. The Knicks have one more win and one more loss, which gives them a better winning percentage and technically gives them possession of the 8th seed for now. However, each team will have played 82 games by the end of the season, and if they are still tied then, Atlanta wins the tiebreaker. The Knicks need to win the 8th spot outright. New York has 6 games left and Atlanta has 8. The Knicks currently have 1 more win than the Hawks and they need to finish with 1 more win than the Hawks. The Knicks will have a day off before hosting the Washington Wizards on Friday. The keys to that game will be containing John Wall and Washington’s 3-point shooting. The Knicks have some momentum, now they need to stay focused. I will be doing pre-game and post-game articles for every remaining game, so be sure to check the site regularly! This entry was posted in Articles and tagged KNICKS, knicks 110 nets 81, knicks beat nets, knicks beat nets recap, knicks blog, KNICKS MEMES, knicks nets, Knicks news, Knicks Playoffs, knicks postgame, knicks postgame recap, knicks recap, new york knicks, New York Knicks Memes, nykm, Tommy Rothman, tommy rothman knicks on April 2, 2014 by Tommy Rothman.